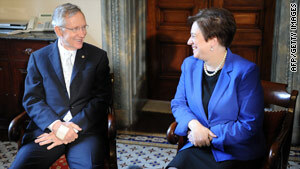 Supreme Court nominee Elena Kagan speaks with Senate Majority Leader Harry Reid on Capitol Hill on Wednesday. NEW: Sen. Jeff Sessions says she "does come out of a tradition of activist judges,"
Sen. Harry Reid says he's confident Kagan "is the right choice"
Washington (CNN) -- Supreme Court nominee Elena Kagan on Wednesday kicked off what has become a ritual for modern high court nominees: making the rounds of key senators' offices on Capitol Hill while saying little to a boisterous press corps in tow. Kagan, who won confirmation as solicitor general a little more than a year ago, started her day meeting with Senate Majority Leader Harry Reid, D-Nevada. She then huddled with Senate Minority Leader Mitch McConnell, R-Kentucky; Senate Judiciary Committee Chairman Patrick Leahy, D-Vermont; and Sen. Jeff Sessions of Alabama, the committee's top Republican. She also met with Sen. Richard Durbin of Illinois, the Senate's No. 2 Democrat. Democrats offered overwhelming praise for the 50-year-old nominee, saying she would be a fair, independent member of the high court and a worthy replacement for retiring Justice John Paul Stevens. Republicans questioned, among other things, Kagan's lack of experience on the federal bench and whether she would be willing to oppose President Obama's agenda when necessary. "There's nothing more exciting than the [confirmation process] we're about to undertake," Reid told Kagan. "The great country that we're in is ruled by law, and that's what you're going to make sure continues." Video: Who is Elena Kagan? Reid later issued a statement that said his meeting left him confident that Kagan "is the right choice to replace Justice Stevens on the Supreme Court. She has a strong belief that the Supreme Court should be a forum where the rule of law wins out and where people from every walk of life can receive a fair hearing." McConnell said on the Senate floor that it's his "hope that the Obama administration doesn't think the ideal Supreme Court nominee is someone who would rubber-stamp its policies. But this nomination does raise the question. And it's a question that needs to be answered." "Americans want to know that Ms. Kagan will be independent, that she won't prejudge cases based on her personal opinions, [and] that she'll treat everyone equally, as the judicial oath requires." Kagan's "never had to develop a judicial habit of saying 'no' to an administration. And we can't simply assume that she would." Welcoming Kagan to his office shortly thereafter, McConnell said he wanted to assure the public "that we intend to go through a thorough process." There will not be a "rush to judgment," he promised. Sessions, however, said that his meeting with Kagan failed to allay his concerns. "She does come out of a tradition of activist judges, as she clerked for two well-respected activist judges," he said. Kagan clerked for the late Justice Thurgood Marshall and former appeals court Judge Abner Mikva. One GOP lawmaker has already declared that he will oppose her nomination, just as he did 15 months ago when she was nominated for solicitor general. Sen. James Inhofe, R-Oklahoma, estimated that more than half of senators already have made up their minds about Kagan, even if they haven't said so publicly. "They just don't say it," he said earlier in the week. "I say it. ""We went through the confirmation process 15 months ago, and nothing has changed since that time," he said. Inhofe said the main sticking point for him was Kagan's decision, while dean of Harvard Law School, to block military recruiters from the law school's campus in protest of the Pentagon's policies preventing gays and lesbians from serving openly in the military. Other Republicans have also expressed concern about the issue. Sessions recently said that Kagan "made a big mistake. ... Was that disqualifying? I don't know. We'll see. But it's a significant issue." Inhofe also pointed to Kagan's lack of judicial background, noting that it has been 38 years since a justice with no experience on the bench has been confirmed. He said that issue is not a "deal killer" for him, although he said that a nominee with prior judicial experience is preferable. Asked whether Kagan's stance on campus military recruitment is rooted in opposition to the "don't ask, don't tell" policy, and not an indictment on campus recruitment per se, Inhofe said he fails to see a connection. "My concern was, if you're recruiting, you ought to be able to recruit on campuses." He accused Kagan of flip-flopping on "don't ask, don't tell," pointing out that she was an aide to former President Bill Clinton and at one time supported the policy. "She's changed her mind since then, apparently," he said. Clinton picked her in 1999 for the powerful U.S. Court of Appeals for the D.C. Circuit. But no Senate confirmation hearings were held, and the nomination lapsed. The seat was later filled by John Roberts, who quickly used the appointment as a springboard to chief justice of the United States. Inhofe said if he opposes someone's nomination, he does not change his mind when that person is nominated for a higher position later. "If I believe someone is not qualified for a lower position, like a district level, how could that person be qualified for the United States Supreme Court? I don't think they could. The bar has to go up as you go up the courts." Asked if there is anything Kagan could say to change his mind, he said that although he is not a member of the committee, "I would watch very carefully -- I would say no." On Monday, Obama nominated Kagan to replace retiring Supreme Court Justice John Paul Stevens. If confirmed, Kagan, 50, would become the 112th Supreme Court justice, the third woman on the current nine-member bench and the fourth woman in the court's history.